The Dartmouth packs a powerful heating solution into a compact, attractive unit. Concealed furniture quality casters mobilize this potent heater allowing you to warm up 1000 square feet in any room that you choose, while traditional design features like the subtly rounded corners allow it to blend in with any style palette. 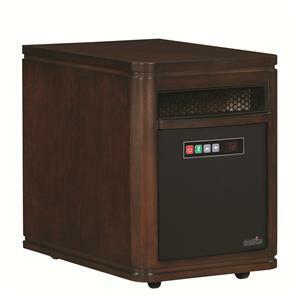 This heater comes fully-assembled and ready to heat, so all you have to do is plug it in to enjoy its warmth. Founded in 1996, Twin-Star International, Inc. is an award winning home furnishings manufacturer which strives to enrich and enhance lives by providing classic furniture designs crafted with old fashion care and attention. Our in-house designers and engineers study the great furniture traditions of times past as well as keeping a pulse on the latest world-wide trends of today to offer the most comprehensive and diversified product line available. All Twin-Star products are diligently inspected from Incoming Materials (IQC), through the manufacturing processes (In-Process) to finished and packed goods, using strict AQL standards. Twin-Star's world headquarters are located in Delray Beach, FL and their 11,000 sq ft China headquarters is located in Southern China, close to most of its manufacturing facilities. Twin-Star's dedicated management is passionate about the products which carry its name. In the end, a true judge of a company is not what it says, but what it does, and our proof is in our products. Ivan Smith Furniture - Shreveport - Jewella Ave.